Anyone looking for a good laugh today? While cruising the usual sites this morning, I noticed that Dan's JP3 page posted a link to what has to be the best JP spoof ever created - "Jurassic People" I decided to give it a look and I'm glad I did! Directed by Jamie Hobert, the spoof is centered around several people that stumble upon the lost Nedry Barbasol can and decide to to down the embryos like shots of vodka. The 20 mintue short is very well done and is much higher production value than most other JP spoofs/shorts. It includes the original JP soundtrack and sound effects which are added in flawlessly. So check it out when you get a chance...you won't be disappointed! First up I wanted to mention our new poll question. This time around we want to know which unreleased prototype would you most like to own? Be sure to let us know by voting today! The next thing I'll mention is regarding our news archives. I went through and gathered up all of our old news stories from our first site at JP3 HQ and then later at Geocities for placement with our current archives. It was really fun looking back at some of the old headlines like our first "JP3 Hasbro Toys Are On Their Way" to "CamoXtreme Chaos" and the whole Tapejara controversy. Fun times indeed. So take a trip down memory lane when you get a chance, I really think you'll enjoy it. "Visitor and Trader Lee has emailed me with news that he has a PICTURE of a possible JPIV John Hammond figure! I haven't seen the picture but hopefully it will be released soon. It comes from a source working for Forbidden Planet, and the rumors are that the JP1 figures may be getting re-released with different accessories in July or August THIS YEAR. Are these 10th Anniversary figures? You'll have to wait and see!" So who knows? We'll all just have to sit back and see but I wouldn't bank on anything at this point because as we all know, Hasbro just dropped the JP license a little over a month ago. Weirder things have happened before though so make sure to keep it tuned here for any further updates. My apologies for not reporting on this Operation Genesis craze sooner but I'm not a big gamer myself so I usually try to leave that to those best qualified. However, "Dinosaur_Neill" has asked us to help him in his attempt at getting the OG soundtrack released. He's started a petition which you can sign & view here. For all the other latest news on OG, make sure to stay tuned to Dan's JP3 Page. He's recently posted an exclusive interview with OG composer Stephan Schütze as well as links to downloadable demos, reviews and much more on the new game. Now this certainly isn't earth shattering news but I just noticed that we had the 500th member register on our Forum today. It's always nice to pass a milestone like this especially considering our very small beginnings. If you haven't registered on our Forum yet, just follow this link and you'll be on your way to posting in no time! On more of a personal note, I'm having to do this update from work today as my home computer saw fit to completely crash on me this past weekend (ugh). It looks like my insurance will pick up the tab though due to lightning damage so I'll probably be able to get a much nicer system this go round. In the meantime, I won't be able to check any email so please make sure that all important site related matters are passed along to Armothe or one of our other staff members. 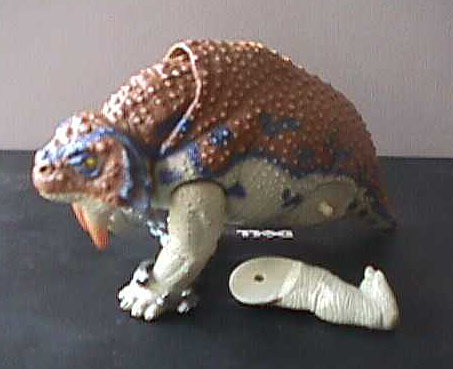 You can find a few more pictures of the Scutosaurus and Ornithosuchus prototypes in our Toy Database. We have been assured these are the real deal by the owner, but the eBAY auction which had these items for sale seems to have disappeared. JP SERIES 2 DINOSAUR PROTOTYPES? 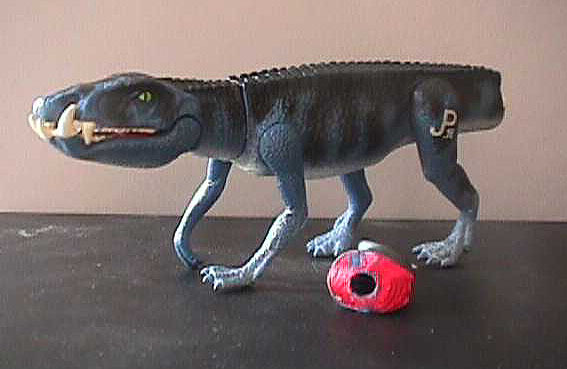 Here are some pictures from a recent eBAY auction, featuring painted prototypes of the Jurassic Park Series 2 Scutosaurus and Ornithosuchus. Are they genuine, or fake? You be the judge! Click on the thumbnails to view larger images. COLLECTOR CARD DATABASE - RELEASED! It's been a long time coming but we are now proud to present to you the JPToys.com Collector Card Database! Once there, you'll find front and back scans of all your favorite JP series 1 & 2 cards as well as the complete set of CamoXtreme cards. We've even included a list to assist you in filling out your collection. Now you may notice that we haven't included the Diecast cards yet. They are soon to follow but we still have just a little bit of work left to do on them before they can be uploaded. That's it for the updates today but make sure to stay tuned for another nice surprise coming soon! On a more somber note, we would like to pass along our condolences to those that lost loved ones in the terrible Space Shuttle Columbia disaster this weekend. Our thoughts and prayers are certainly with you. Those seven brave souls that gave their lives may be gone but will never be forgotten. Our good buddies at ProBoards will be upgrading their forum software this weekend. As a result the JPToys forum might be experiencing some downtime. - Calendar for posting events!